Each month, we like to share stats with you, on the usage and popularity of different software stacks within Jelastic PaaS. It’s time to update you with last month stats. With over 30,000 developers now using Jelastic, we are getting better and better source for measuring the popularity of stacks which are used in the environments these developers have created in Jelastic. It’s even more interesting, because the scope of our stats has grown: we have a new hosting partner in Finland, Planeetta. 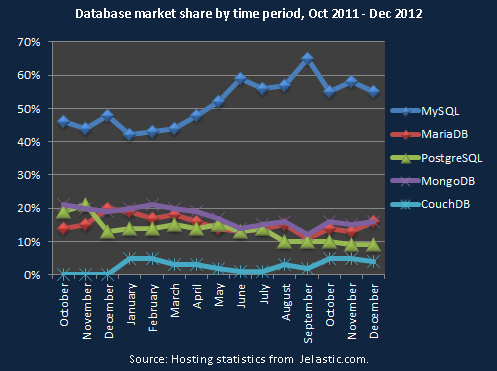 So, let’s see the stats on databases, servers and JVMs for December 2012 and analyze the differences between developers’ preferences. 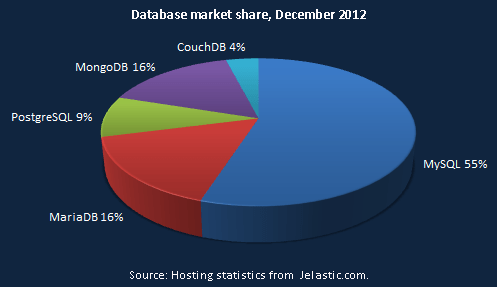 Below it is presented the popularity of MySQL, MariaDB, Postgres, MongoDB and CouchDB among developers on Jelastic in December 2012. As you see the leader is the same, but comparing with the previous month it has lost market share: a 3% decrease over November. If we look at the database popularity by region, there are big differences between database popularity in different countries. For example, MySQL is not so popular in Finland if you compare it with other countries. 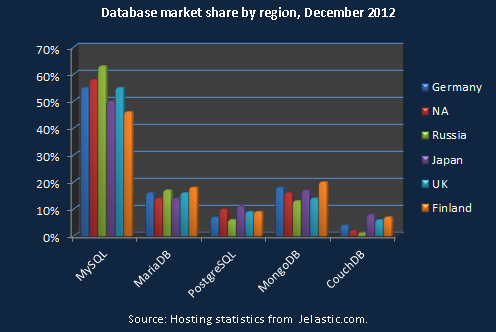 But the rest databases are more popular among Fins. Here’s how the numbers have changed from October 2011 through December 2012. 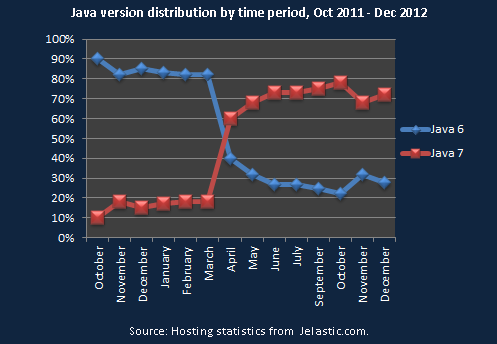 As you can see, Tomcat 7 has not lost any ground: a 6% increase over November. Jetty has lost 4% of a share. 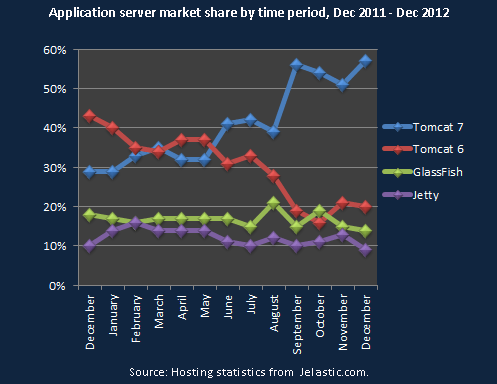 The popularity of Tomcat 6 and GlassFish has stayed about the same. If we compare usage based on regions in December, there are some differences between developers’ server preferences this month. 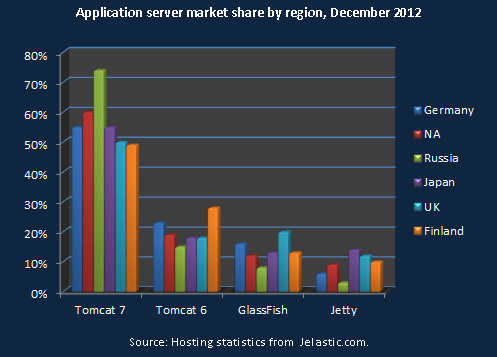 Russians are fans of Tomcat 7, at the same time a lot of Finnish developers are still using Tomcat 6. 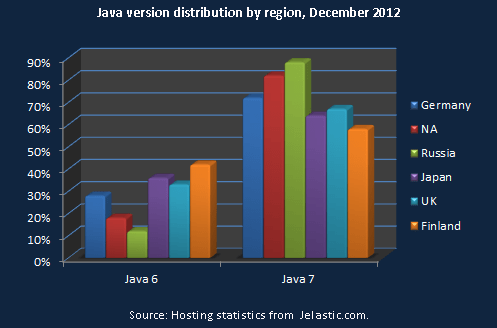 Though usage of Java 7 still remains a bit higher than Java 6. There is a bit of discrepancy in what developers from different countries prefer. 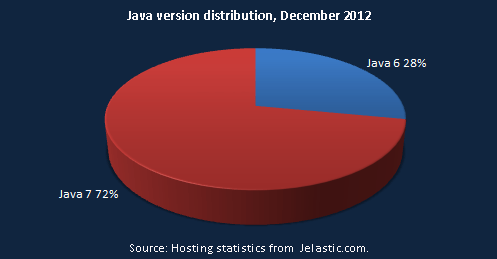 The percentage of Java 6 usage still stays quite high in Finland. Now, let’s see the trends over the last 14 months! We’ll continue to keep posting our monthly updates. It will be interesting to see how these numbers change as the Jelastic user base grows. Stay tuned!